The dark, gritty story surrounding the death of Jennie Cramer came to my attention because my Great Great Grandmother, Ann Carroll Stanford’s, sisters Nellie Carroll and Mrs. Mary Carroll Clarke were called as witnesses during the trial. At the time Savin Rock in West Haven, where the body was found, was a popular destination for the irish families in New Haven. Nellie and Mary were at Savin Rock the last night that Jennie Cramer was alive. They testified that they saw her. In 1881, working class girl, Jennie Cramer, was dating James Malley, the nephew of one of New Haven’s richest men, Edward Malley. Jennie had been staying out late with James and her mother had kicked her out of her house. That was the last time that Jennie’s mother saw her alive. 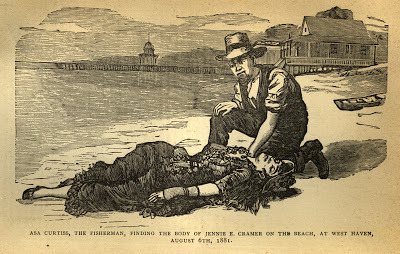 Her body washed up on shore on August 6, 1881. In the ensuing trial there were accusations that due to witness bribary and altering of the charges favored the accused. James Malley, his cousin, Walter Malley and Walter’s friend, Blanche Douglas, were aquitted.